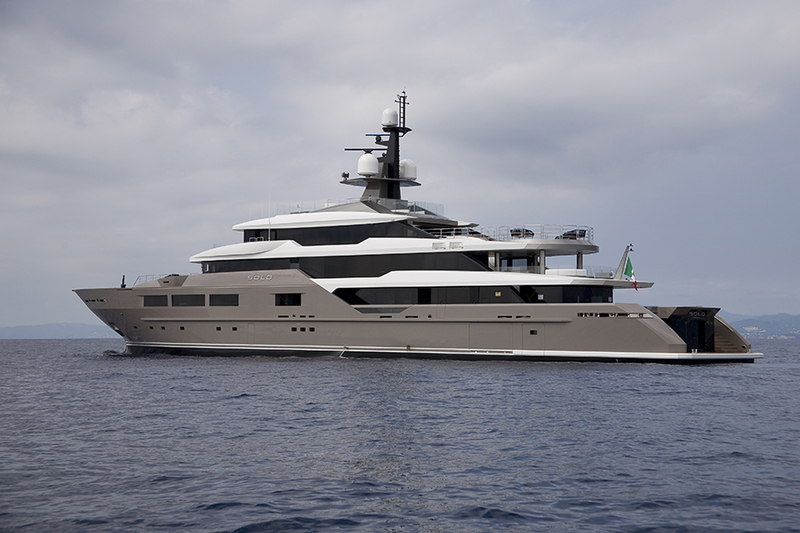 Tankoa Solo made her international debut at the Monaco Yacht Show before her official delivery in November. 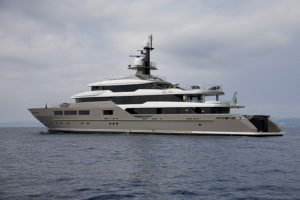 Tankoa 72-meter/236’ Solois not only a gorgeous looking yacht designed for her exterior lines by Francesco Paszkowski with interior by Paszkowski’s interior lead designer Margherita Casprini, she is also one of the most technically advanced yachts in her category with hull design by Professor Ruggiero. 72 meters long and 11.60 meters wide, Solo is 1,600 GT with a displacement of 1,120 tons at half load and 1,240 tons at full load. 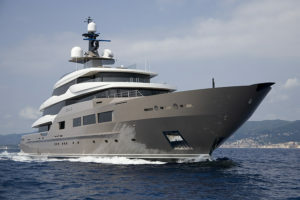 Powered by twin Caterpillar 3516B main engines developing 1,825 kW, she is capable of 17.5 knots top speed. At 10 knots, with one generator running, she burns a total of 195 liters per hour, providing a range of 7,000 nautical miles. At 15.7 knots, she burns 570 liters per hour for a range of over 4,000 nautical miles with a 10% margin. 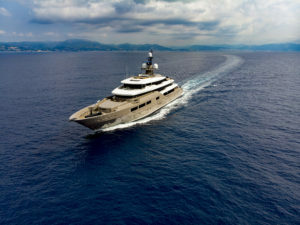 At her full speed of 17.5 knots, she still has over 3,000 nautical miles range with a 10% margin. 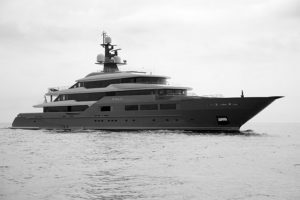 Tankoa 72-m/236’ Solo, apart from being one the most efficient yachts in recent history, is high tech, eco-friendly and an incredibly well-equipped superyacht. 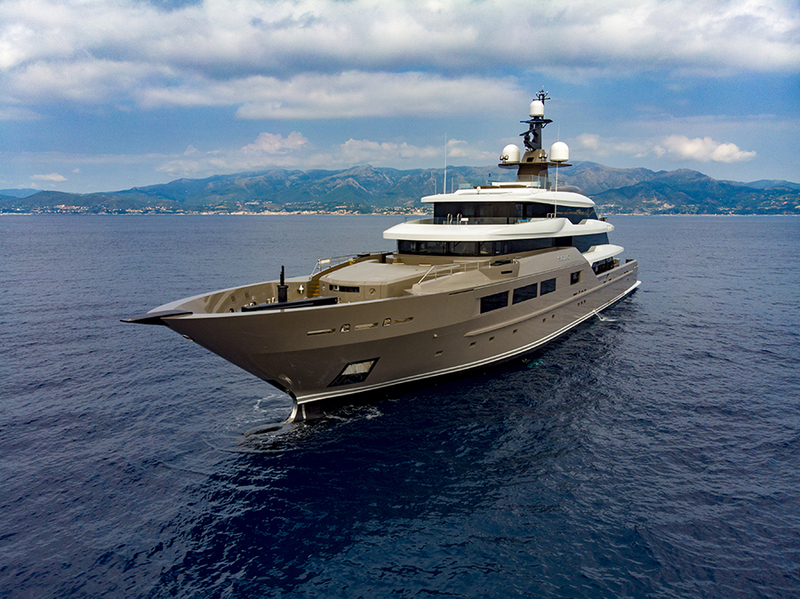 Like all yachts in the Tankoa range, she comes with independent rudder systems, in her case from Rolls Royce, allowing manoeuvring in the tightest situations supported by a 200-kW Naiad hydraulic bow thruster. 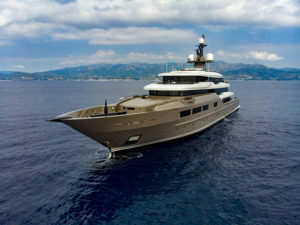 The three Northern Lights generators, two 230 kW and one 155 kW, are equipped with HUG soot burners to eliminate the usual black smoke stain on the sides of the hull and allow guests to enjoy all the exterior aft decks as well as the beach club with open terraces with no odours than the sea and salty air. The main engines are equipped with Eco Spray SCR (Selective Catalytic Reduction), significantly reducing emissions. 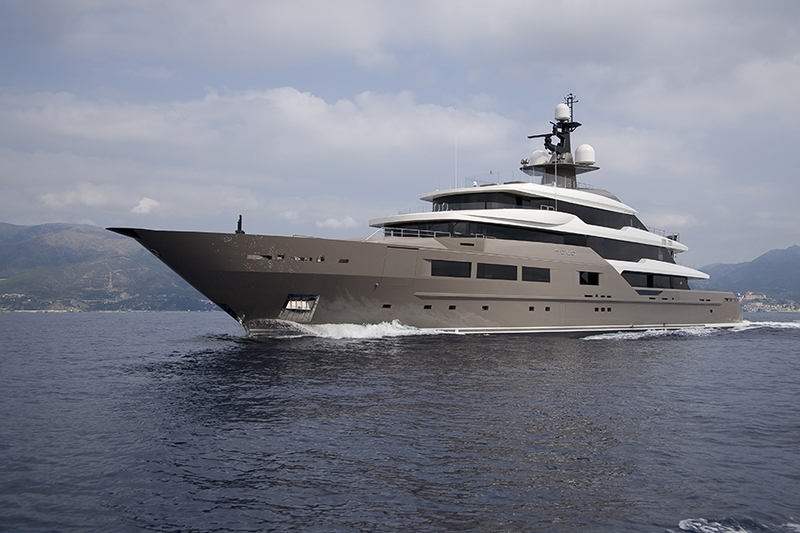 At Tankoa we think about the next generation, so the yacht is also equipped with a CO2 monitoring system allowing the captain to constantly find the sweet spot in terms of speed to reduce emissions to the minimum. 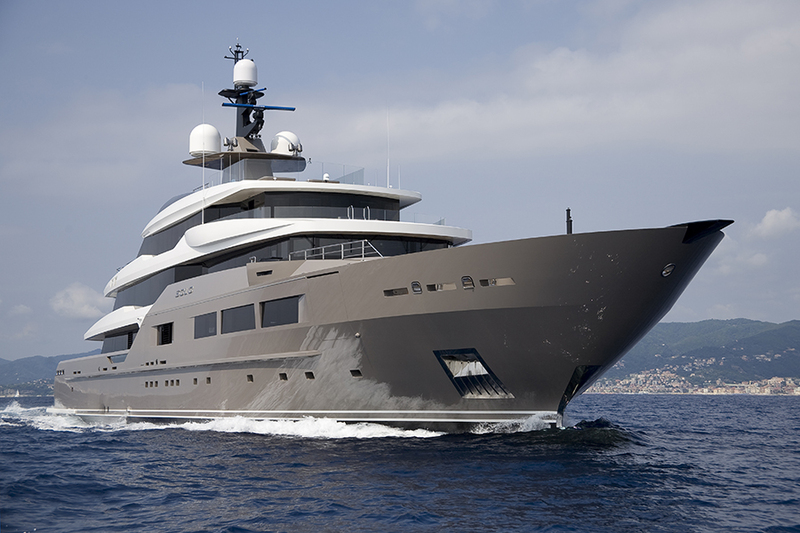 Thus, the yacht is delivered with an Environmental Management Plan (EMP) manual. Solo has also been built according to the B5th rule requiring on fuel tanks that do not exceed 36-cubic meters each and build structurally at 1/5th of the maximum beam from the hull sides. As a result, fuel spillage risk is very limited in case of lateral collision. 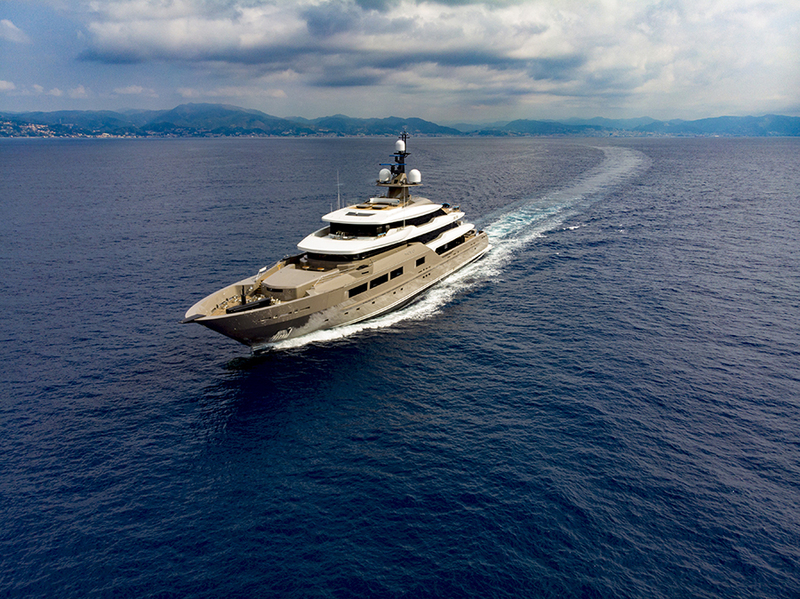 As safety and comfort are paramount, she is equipped with lots of redundant equipment, including two independent stabilizer power packs powering the four zero -speed fins of 3.6 square meters each. The construction of Solohas been followed and classed by both Lloyds and RINA who granted a paperless bridge certificate. The wheelhouse is also equipped with a semi-integrated Boening console. 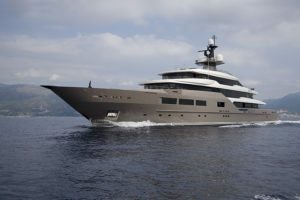 Solo has accommodation for 12 guests in six cabins, including the master suite on the gigantic private owner’s deck, a VIP suite and four doubles (two of them convertible into twins) located on the main deck to ensure total quietness. In addition, the hair dressing/massage room and the owner’s study can also be converted into additional cabins as they are both equipped with an en-suite bathroom. The VIP and guest cabins offer astonishing sea views, thanks to unusually large windows. The beach club, a key feature aboard Solo, is a spacious and welcoming area. 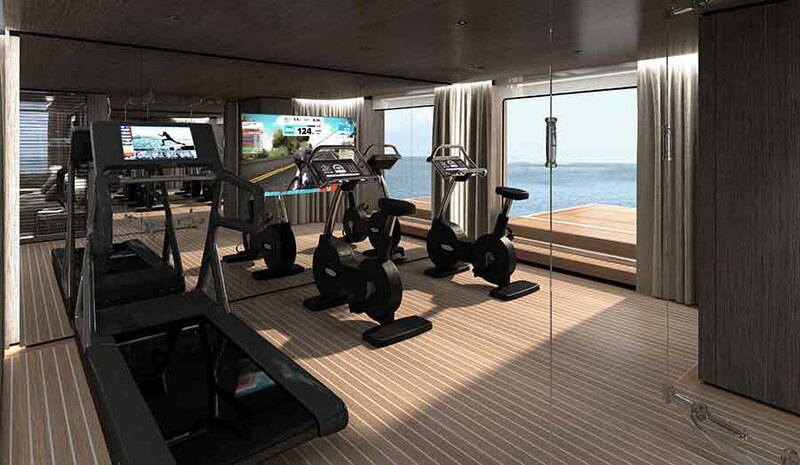 Equipped with sofas, bar, TV, bathroom, and an oversized glass-walled gym by Technogym with fold-out terrace, it is also directly linked to the spa zone. The latter comes with a sauna, also fitted with its own fold-out terrace, hammam and 5o Celsius chilled water shower. 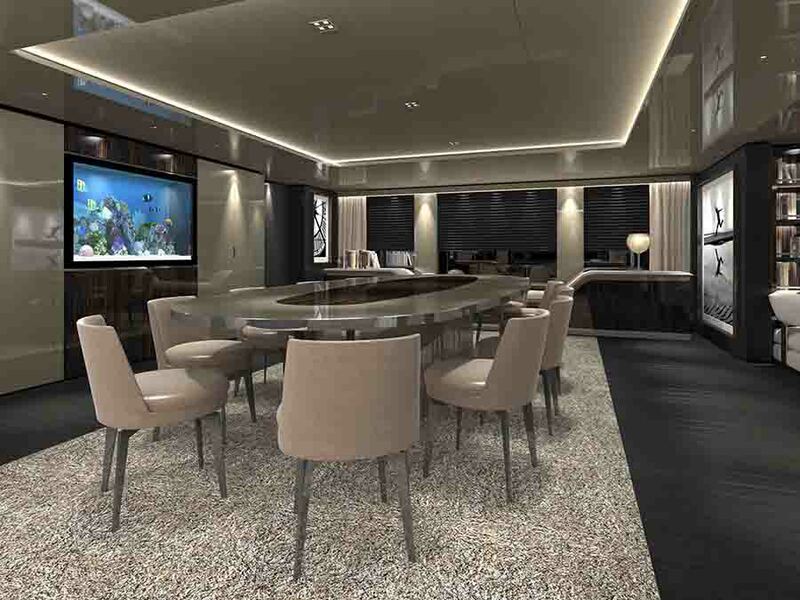 The upper deck houses the paperless semi-integrated Boëning bridge with radio room, comfortable captain’s cabin, and a hair dressing/massage room that can be converted into an additional cabin for a bodyguard or an officer. 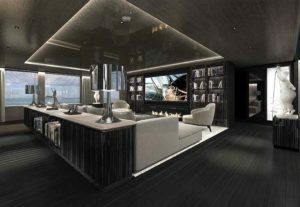 The aft section of this deck features an enormous observation lounge with almost floor-to-ceiling windows, 90” 4K QLED TV screen, baby grand piano, bar and bio-ethanol fireplace. The owner’s apartment features an owner’s study/media room. The island bed is surrounded by full-height windows with 180° views, an overhead skylight and direct access to two intimate outdoor terraces, shaded sun pads and a Bisazza mosaic-tiled, glass- walled Jacuzzi. 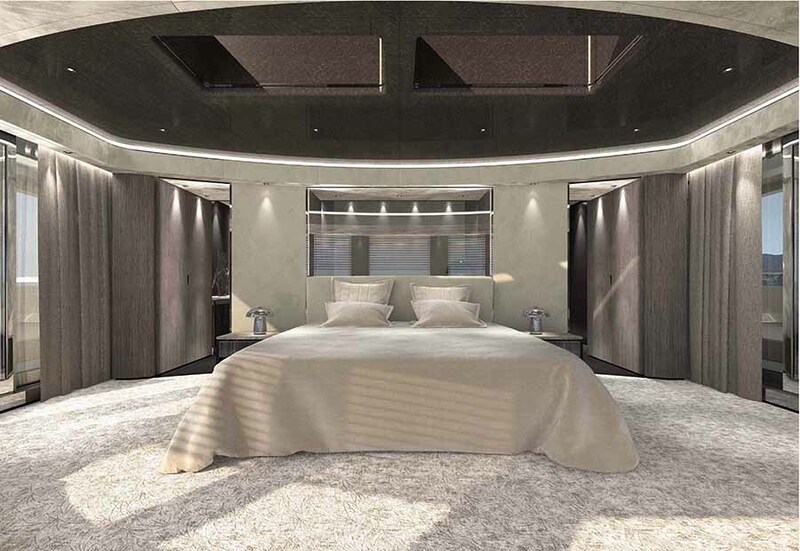 The owner will be able to arrive in style using the touch and go helideck aft (with a 4.5-ton certification, sufficient for most twin turbine helicopters, such as an Augusta 109), and has his own Jacuzzi, bar, saloon, outdoor breakfast corner and day head with shower. 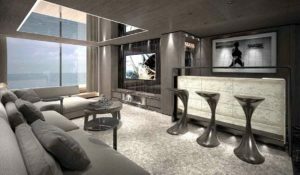 On the same deck, the owner can enjoy his own independent TV room, also convertible in an additional cabin thanks to an additional bathroom. 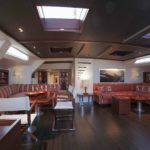 The aft deck is equipped with a six-meter transversal swimming pool, sofas and a pop-up TV screen recessed into the ceiling to turn this entire space into an outdoor cinema “room”. 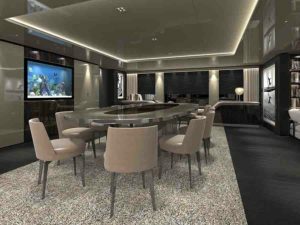 Forward of the winter garden and reception desk/bar, the main deck houses a cinema lounge/library that can be enclosed by an electric sliding glass panel, the dining room with its table for 16, and a stabilized fish tank. The cut-down bulwarks with laminated glass panels allow for sea views while having dinner. 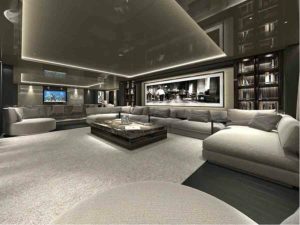 The under lower deck is devoted to a laundry room, pump room, storage, garbage freezers, AC units and technical spaces. 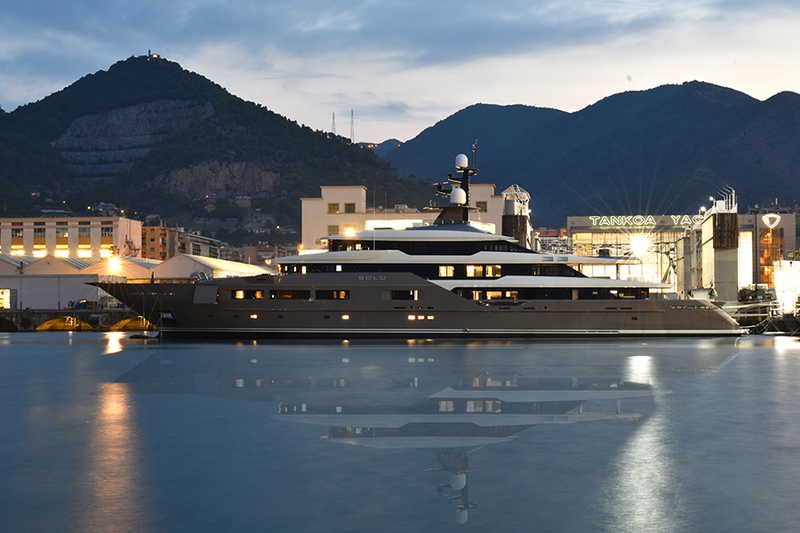 The central tender bay houses two custom-made 7.50-meter luxury tenders and extensive diving equipment while most of the many toys are stored in the forward side garages. 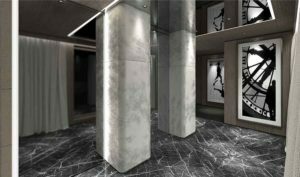 Regarding the design, FPD Studio in cooperation with Margherita Casprini was given instructions by the owner, who wanted interiors offering a strong contrast with the exterior. He wanted something modern, minimalist and warm at the same time. 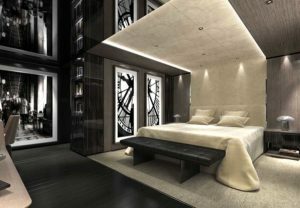 Another of his wishes was to the extensive use of natural materials assembled in a way that the décor would offer great balance and modernity, while also being timeless and understated. 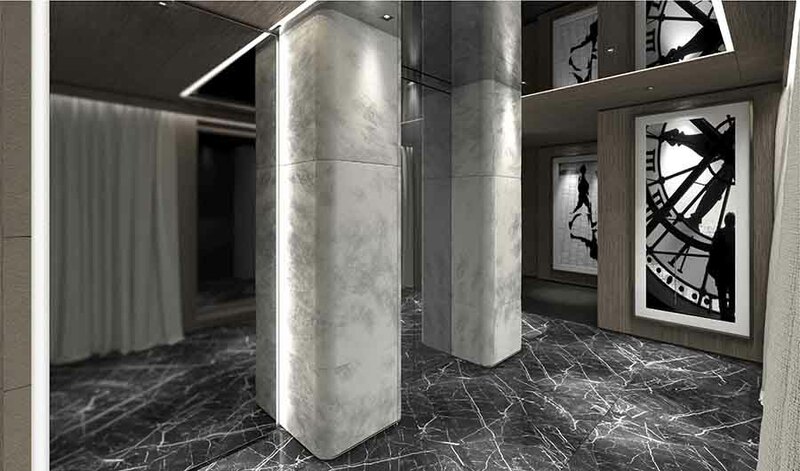 As a result, all the marble used in the yacht, with the exception of the onyx, has a satin finish. Most of the wood is also satin finished while it is highlighted with high-gloss Macassar ebony. The carpets are tailor-made for Solo and furniture tops are either satin Cappuccino marble imported from Jaipur in Rajasthan, or natural hard leather panels with saddle stitching. Main woods are: high gloss Macassar ebony, “fiammato grigio”, custom tinted grey oak and black oak. Ceilings are made of brushed aluminium panels, tinted grey oak and nubuck. Stones are Forest Black Antique marble from France, Cappuccino marble from Rajasthan, Striato Elegante Honed marble from India, and Pure White Onyx from Mexico. 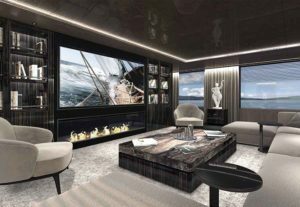 Interior sofas, chairs and armchairs are from Fendi Casa. Exterior sofas and seatings are from Kettal and Tribu. Interior fixed ceiling lights are from Altraluce. Exterior fixed ceiling lights are from Palagi. Loose light fixtures are from O Luce, Penta Light and Fontana Arte. Bar stools are made in Italy by Cedrimartini. All faucets are from Dornbracht (Germany). Stairwell flooring is of white Onyx Cristallino while the walls are made of destressed oak sourced from a 300-year-old farm in Norway. Hammam marble is Calacatta from Tuscany. The sauna wood has been sourced from a medieval castle in Finland.